Ideally located on the edge of Lake Serre-Ponçon, in the heart of the Hautes-Alpes, between Provence and high mountains, the Domaine L'Ecrin du Lac in Chorges welcomes you in one of its 70 accommodations. Near the Ecrins National Park and 25km from Gap. Its exceptional location offers a dream panorama, dazzling and changing with the seasons! For your relaxation, enjoy the superb outdoor pool on the lake and a private access directly on the lake. The little ones will enjoy the paddling pool, separated from the pool. Lounge chairs available free of charge. They will also have free access to the children's playground with inflatable castle in summer, the volleyball field and multisports. For petanque fans, 2 boulodromes are available in the area. In July / August, these are the months of animation in the holiday village! The children's club "Les Marmottes" will welcome children from 5 to 12 years old free of charge. Supervised by animators, they can participate in various activities: DIY, water games, theme days, shows ... for about 4 hours / day Monday to Friday. In the evening, relax & nbsp; during aperitif games, entertainment, dance evenings, karaoke, photo projection ... and many more! Bar / Snack in July and August, panoramic terrace and lounge with tv. Snacks in summer. Many sports activities are available nearby (preferential rates on some). Additional information from the domain. Chalet of 3 rooms of approximately 36-40m ² being able to accomodate up to 6 people. 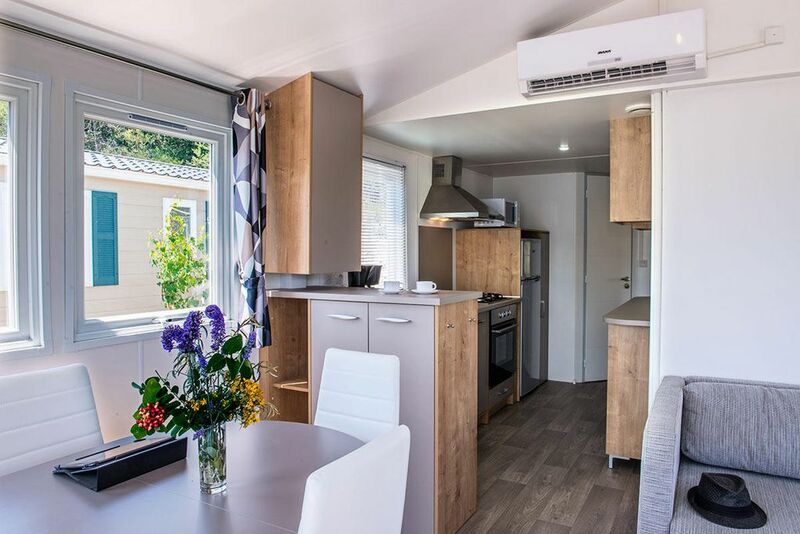 It consists of a living room with sofa bed for 2 people, a fully equipped kitchen, a dining area, a bedroom with 1 double bed (140cm), a second bedroom with 2 single beds ( 90cm) and a bathroom with shower and separate WC. Wooden outdoor terrace of about 20m². The kitchen area is equipped with a fridge, 4 hotplates, a microwave, a coffee maker and a dishwasher. Utensils and crockery for 6 people. The living room includes TV and air conditioning. Terrace with garden furniture (overlooking the lake). Bed linen and towels are not included. Rent possible on the spot. To be booked in advance and paid locally. A parking space near the housing. Wifi access: The connection is not free and costs € 23 for the first week, € 33 for 2 weeks (1 code for 2 devices connected not simultaneously). Pets allowed: 30 € / stay. Categories 1 & 2 prohibited. Maximum 2 / accommodation - to be specified when booking. High chair: Up to 2 years: 30 € / Stay. To book and pay locally. Linen set: 13. 50 € / person / week (including bed linen, towels). Mandatory change every week. Laundry: automatic on site (5 € / wash). Cot: Up to 2 years: 30 € / Stay. To book and pay locally. Tourist tax (extra charge): To be paid according to current rate / day / persons + 13 years. To be paid on the spot. Grenoble: N85 to N94 and GAP to Chorges. Marseille: A51 to Saulce, then N85 to Tallard and then N94 and D942 to Chorges.